Home» Verdun » 53rd Infantry Regiment – Vauxstürmer! A luger that fought at Verdun. 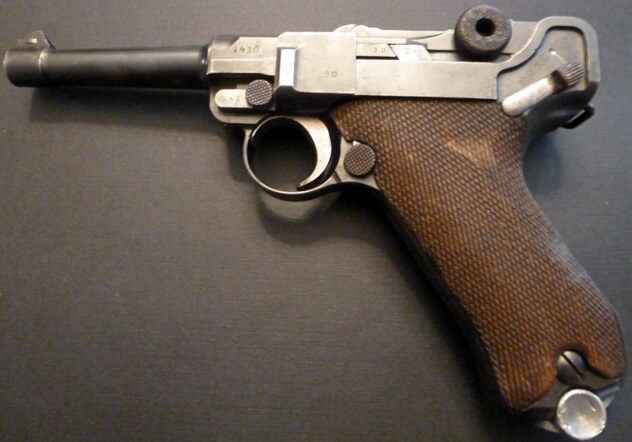 This specific pistol – a Deutsche Waffen- und Munitionsfabriken (DWM)-produced Model 1908 9mm Luger – was produced in 1915. It has the serial number 1430 d on the barrel and upper receiver and 741 d on the lower receiver. The weapon has a unit marking on the front grip strap of 53. 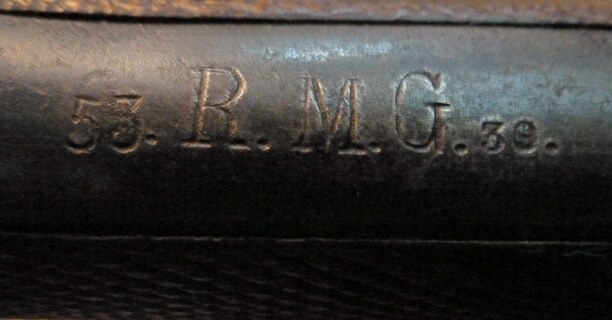 R. M.G. 39. This marking corresponds to the 53rd Infantry Regiment, specifically the Machine Gun Company. The last digits, 39, indicate that it was the 39th weapon in the company’s arms room, undoubtedly belonging to a machine-gunner. Throughout Germany, the regiment – along with the 158th Infantry Regiment – received the nickname of Vauxstürmer, “Fort Vaux attacker” after seizing this key French fort during the Battle of Verdun in 1916. A machine gun or, better, group of machine guns, could deny the enemy safe access to a chosen area of the battlefield. They could do this to ranges of one mile or more. At closer ranges, machine guns could sweep enemy parapets, fire on fixed lines and directions, or conduct night fire on lines set during daylight. Fired from flanking positions, to catch advancing enemy troops in enfilade, they were particularly deadly. This is because machine-gun fire is far more deadly than rifle fire. The gun’s mount gives it superb precision and absorbs its recoil. Also, , once the gun has been ‘laid’, its aim cannot be disturbed by the effects of fear or excitement on its gunner. Machine guns are fired in bursts, to avoid overheating, in which the bullets do not follow precisely the same trajectory, but instead form a ‘cone of fire.’ Where this cone intersects with the ground a ‘beaten zone’ is formed: an elliptical area over which the bullets are distributed. This ‘beaten zone’ is frequently better termed a ‘zone of death. In 1914, most infantry regiments had a machine gun company equipped with six Model 1908 guns. 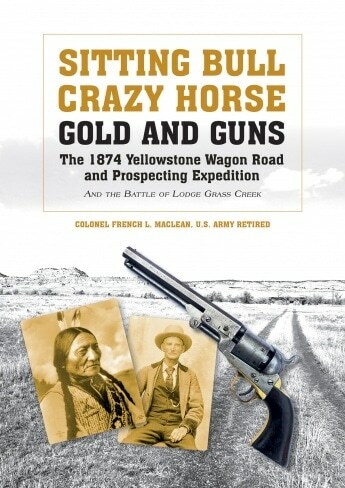 Each company was comprised of two officers, 95 non-commissioned officers and other ranks, 45 horses (each gun was transported by two), three ammunition wagons, one field kitchen, one store wagon, one fodder wagon and one baggage wagon. There was also one extra machine gun, also drawn by two horses. A machine gun section consisted of one gun and six men. A corporal commanded the team; other members were the 1st gunner, 2nd assistant gunner (who helped carry ammunition), 3rd gunner (who helped carry ammunition), and the 4th and 5th gunners to drag the gun for short distances. Machine guns quickly proved their worth and within a year, the Supreme Command decided that each infantry battalion would have its own machine gun company, in addition to the regimental machine gun company, although fielding the guns in sufficient numbers took an additional year. When the war began in August 1914, approximately 12,000 MG 08s were available to battlefield units; production at numerous factories ramped up during wartime. In 1914, some 200 MG 08s were produced each month; by 1916 – once the weapon had established itself as the pre-eminent defensive battlefield weapon – the number increased to 3,000; a year later to 14,400 per month. The Model 1908 (Maschinengewehr 08) was an adaptation of Hiram S. Maxim’s original 1884 Maxim gun. The weapon was so-named after 1908, its year of adoption. It could reach a firing rate of up to 400 rounds per minute using 250-round fabric belts of 7.92x57mm ammunition, although sustained firing would lead to overheating. The weapon was water-cooled using a jacket around the barrel that held one gallon of water. Using a separate sight with range calculator for indirect fire, the MG 08 could be operated from cover, such as on the reverse slope of a hill. Additional telescopic sights were also developed and used in quantity during the war. The gun weighed 58 pounds; the water as coolant nine pounds and the tripod 85 pounds. The gun’s practical range was estimated at some 2,200 yards up to an extreme range of 3,900 yards. The MG 08 was mounted on a sled mount when in firing position; for short distances near the front line, it could be ferried between locations either on carts or else carried above the men’s shoulders in the manner of a stretcher. Pre-war production was by Deutsche Waffen und Munitionsfabriken in Berlin and the government arsenal at Spandau (so that the gun was often referred to as a Spandau MG 08.) During the war, it earned the nickname the “Devils Paintbrush,” based on the fact that the weapon could – and often did – literally mow down hundreds of charging enemy soldiers in no-man’s land. The 5. Westfälisches Infanterieregiment Nr. 53 (5th Westphalian Infantry Regiment 53) was formed on July 4, 1860 in Münster in the Prussian province of Westphalia. In 1864, it fought against Denmark in the Second Schleswig War, participating as part of the 13th Infantry Division at the pivotal Battle of Dybbøl. Four officers in the regiment won the Pour le Mérite decoration for bravery; the unit suffered 45 killed in action during the war. In the Austro-Prussian War of 1866, it fought with the “Division Goeben” in the “Main Army” in southern Germany in the Battle of Aschaffenburg, Battle of Tauberbischofsheim and the Battle of Gerchsheim, fighting against Bavarian forces that were allied to Austria at the time. Thirty-three soldiers in the regiment died in the war. In the Franco-Prussian War of 1870/71, the regiment fought as part of the 14th Infantry Division (VII Army Corps) at the Battle of Spicheren (August 6, 1870,) Battle of Colombey-Nouilly (August 14, 1870,) and Battle of Gravelotte-St. Privat (August 18.) Thirteen regimental officers and 73 men were killed in action in the war. After the war, the regiment had its headquarters at Münster, Paderborn, Aachen, Jülich and Köln. Ceremonial heads of the Regiment included Crown Prince Friedrich Wilhelm beginning in 1864; after he became the Prussian Kaiser, the regiment received the nickname “Sons of the Crown” and the unit began wearing epaulets with a large crown adorned (left), the only regiment in the army with solely a crown on their insignia. In 1898, the sister of Kaiser Wilhelm II, Viktoria, the Princess of Schaumburg-Lippe, became the honorary regimental commander. At the start of World War I, the unit – now known as Infanterie-Regiment Nr. 53, (53rd Infantry Regiment) was originally subordinated to the 14th Infantry Division. The division, part of the German Second Army (Colonel General Karl von Bülow), VII Army Corps (General of Cavalry Karl von Einem), fought at the Siege of Liege (August 5-16, 1914), the Battle of Charleroi (August 22-23, 1914), the Battle of St. Quentin (August 1914) and the First Battle of the Marne (September 1914.) The initial aim of von Bülow’s army, which comprised 320,000 men, was to seize the city of Liege (Lüttich), gateway to Belgium, which blocked the narrow gap between the “Limburg appendix” and the Ardennes, the best entrance into Belgium. However Liege was defended by a ring of twelve heavily armed forts built on high ground in the 1880s, six on each side of the Meuse River, each 2-3 miles apart, and some 3-6 miles from the city itself. The forts contained a total of 400 retractable guns, up to 210mm in size. Attacking from the north, the 53rd Infantry Regiment (part of the 27th Infantry Brigade) seized the high ground west of Fort Barchon on the night of August 5-6, 1914. However, the German infantry forces made little progress and after trying zeppelin bombing attacks, the Germans introduced a weapon which had until that point remained unknown to the Allies, Austrian-built 17-inch howitzers. With the significant aid of the howitzers and a pair of Krupp-made “Big Bertha gun” (a 420mm Gamma Mortar siege howitzer) the forts were finally taken on August 16. In March 1915, the Supreme Command created the 50th Infantry Division transferring in the 53rd Infantry Regiment, the 158th Infantry Regiment and the 39th Fusilier Regiment. Initially, the division was equipped with captured Russian artillery, outdated rifles and inferior gasmasks, but over the next months was modernized. In May 1915, the division was engaged in mine warfare in the positional fighting in the Champagne Front south of Somme-Py. From June to October 10, 1915, the division occupied the sector of Tahure, seeing action in the Second Battle of Champagne as part of the VIII Reserve Corps (Major General Paul Fleck.) From September 22 to October 10, 1915, the 53rd Infantry Regiment suffered casualties of 56 officers and 2,583 men. Brigadier General Georg von Engelbrechten was the division commander. The division subsequently departed the front and reorganized near Vouziers and Juniville until November 7, when it returned to action in the Prosnes-Prunay sector (east of Rheims), where it remained until April 1916. The 50th Infantry Division then deployed to the Battle of Verdun, where it recorded its greatest glories of the war. On Friday, April 14, 1916, the 50th Infantry Division arrived to strengthen the XV Army Corps (General of Infantry Berthold von Deimling) near Fort Vaux, making preparations for continuing the battle. On Monday, May 1 the German attack on Fort Vaux began, the intent of the army command to clear the French lines in the Bois de la Caillette first before the fort is actually attacked. However, by Sunday, May 7, it became clear that the German attack had failed again. The French artillery fire, led by observation balloons and aircraft, proved too strong. Prior to the assault, the men in the regiment had practiced assault techniques. The Germans tried again during the month, inching closer and on Thursday, June 1, 1916, following a lengthy bombing and with the use of a number of flame-throwers, the Germans finally regained command of the Bois de la Caillette. The Bois Fumin, situated southwest of the village of Vaux, was also taken with the effect that the German troops in front of Fort Vaux were no longer controlled by the flanking French fire from the Bois de la Caillette and the Bois Fumin. After this maneuver, the German attack focused on Fort Vaux, a medium-sized fort generally accounting for a garrison of 250 men, but now accommodating some 600. The commander, Major Sylvain Raynal, suspected a large attack soon: in the morning the fort was caught in a rain of shells, Raynal counting 1,500 to 2,000 direct hits an hour. German machine guns – very likely including the gun crew to which this Luger belonged – began firing to isolate Fort Vaux from possible French reinforcements from the south. The attack began at 4:00 a.m., Friday, June 2, and soon assault groups of the 53rd Infantry Regiment, under the command of Major Hans von Troilo, and the 158th Infantry Regiment (Major Kühl) were able to surround the fort almost completely, seizing a few hallways inside as well. French soldiers inside the fort stubbornly defended. On Sunday, June 4, to smoke out the French, the Germans brought up their flame-throwers, but the attempt fails, as wind currents forced the smoke out of the fort and obstructed the attackers in their actions. The French again launched a few counter-attacks, but were stymied by German machine guns and reinforcements, who forced the attackers back in a man-to-man fight. The Germans were again hindered in their movement by the French bombardment. The machine gun company of the 53rd Infantry Regiment was commanded by Lieutenant Werner Müller. On Monday, June 5, inch by inch, the Germans forced their way into the fort where the French, behind a barricade of sandbags, keep up a stout defense. Major Raynal organized the defense in a heroic manner, but was concerned about the limited amount of drinking water available within the fort. The water tank contains less water than the gauge glass indicated and the water ration of 1 liter a day per person was reduced to just 1/8 liter. The wounded received double this amount. Raynal sent carrier pigeons with messages begging for reinforcements. A company managed to reach the fort, but of the original 170 men, only 26 survived. The Germans attempted to blow up the fort with demolition charges, but the attempt fails due to French artillery fire from the nearby-situated Fort Souville. By Tuesday, June 6, the situation in the fort was terrible. In much of the fort, it was pitch dark. Panic attacks started, when a German gas attack was suspected, but it was a false alarm. The men were going mad with thirst, licking condensed water off the walls and some drinking their own urine. The stench was unbearable because the latrines were out of reach; Raynal finally decided to surrender. The next day, a white flag appeared on top of the fort and a French orderly delivered to Lieutenant Kurt Rackow, the German commander of the lead company of the 158th Infantry Regiment, a letter from Major Raynal, requesting an honorary surrender of his garrison. This was granted and the garrison surrendered in a military correct fashion; arms presented. The Germans treated the defeated French with respect: souvenirs were exchanged and photographs taken. The German Crown Prince Wilhelm, who would later review the victorious 53rd Infantry Regiment after the battle (see photo above) received Raynal with full honors, expressed his admiration for the heroic opposition and presented Raynal with a sword as a mark of distinction. For several weeks, the regiment remained near Fort Vaux, repelling several French attacks. 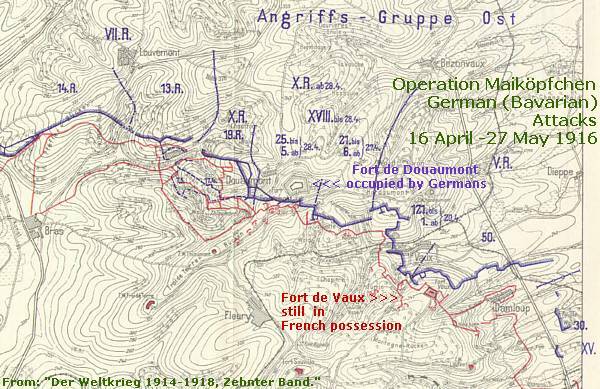 German records classified the fighting of the division of June 2 as the “Erstürmung von Damloup; Erstürmung von Fort Vaux” and fighting from June 3-June 7 as the “Kämpfe in und bei Fort Vaux; Kämpfe südlich Fort Vaux, Berg-Wald, Laufee Wald.” The division’s fight on June 21 was listed in German records as the “Erstürmung der Batterie A und des Steinbruchs südwestlich Fort Vaux.” The division’s battle on July 3 earned a recording of “Erstürmung der hohen Batterie de Damloup.” From June 1-9, the 53rd Infantry Regiment suffered five officers and 54 enlisted men killed in action and seven officers, 226 enlisted men wounded in action. Exhausted by these battles, the division was sent to rest and reorganized in the vicinity of Étain in July, later occupying the calm sectors of the Woëvre. At the end of July, the 50th Infantry Division went back into line at Verdun, 500 yards south of Fort Vaux. It launched an attack on August 1 at the Bois de La Laufée, and defended against the French offensives of August 8 and October 24, suffering heavy losses, holding this sector until November. On just October 24-25, the regiment suffered 39 enlisted men killed in action and three officers and 107 enlisted men wounded in action. German records classified the fighting of the division during this period as the “Stellungskämpfe vor Verdun.” The division was then ordered to the Argonne, where it took responsibility for a sector at Vauquois. Withdrawn from the Argonne on February 15, 1917, the division remained at rest in the area of Saulces-Champenoise until the end of March, then in the camp at Sissonne, then at Thenailles, near Vervins (beginning of April.) 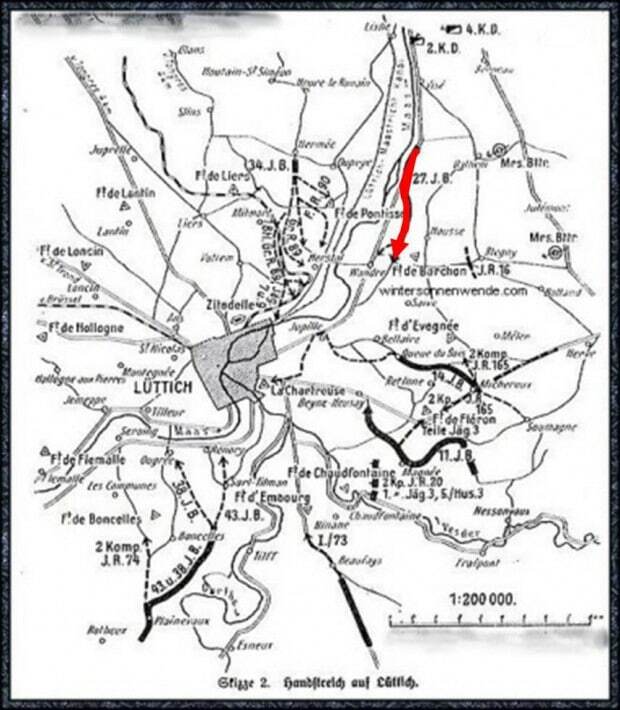 It was concentrated on April 8 in the Aisne Sector under the Seventh Army; it went into action at Juvincourt-et-Damary and there underwent the French attack of April 15, that became known as the Second Battle of the Aisne. After a French breakthrough by the XXXII Corps against the German 5th Reserve Infantry Division, a counterattack by the 50th Infantry Division, under Major General von Engelbrechten saved the day and stopped the enemy advance. After heavy losses, it was relieved at the end of the month and went for reorganization to Nizy le Comte, near the Sissonne Camp. About May 10, 1917, the division went back into line east of Allement on the Chemin des Dames. It was sent to rest in July in the vicinity of Mons en Laonnois, Coucy les Eppes and Parfondru. At the beginning of August, it came back to the Chemin des Dames. Following the French offensive at the Battle of Malmaison, the 50th Infantry Division retired on November 1, to the north of the Ailette River toward Neuville (outside of Chamouille) and was still occupying this sector in December 1917. The 50th Infantry Division was withdrawn from line near Ailles (west of Craonne) on January 9, 1918, and moved to the Chimay area, where it arrived on January 14. It remained here for a month and trained in open warfare for the upcoming “Kaiserschlacht” (Kaiser’s Battle.) The division then moved to the La Capelle-Fontenelle area for rest and further training. In the middle of March, the division, part of the German Eighteenth Army’s IX Army Corps, moved to the front, and on March 21, 1918, attacked west of St. Quentin as part of Operation Michael; it captured the village of Holnon during the day, Étreillers on March 22, Hangest-en-Santerre on March 29 and reached Moreuil on the Avre River southeast of Amiens on March 30. The division withdrew about April 1, after having suffered severe losses, and went to rest, refit, and train in the Lassigny region. On May 27, 1918, as part of the German Seventh Army (Colonel General Max von Boehn) in the Blücher-Yorck Offensive (which became known as the Third Battle of the Aisne,) the 50th Infantry Division attacked near Craonne, reached Pontavert toward noon and crossed the Aisne River. The next day it crossed the Vesle River west of Breuil sur Vesle and continued to the south, where it repelled a French counterattack. On May 30, it reached Goussancourt, and then the Marne River east of Dormans. After having suffered severe losses, it was relieved by the 28th Reserve Infantry Division during the night of June 12-13, and went to rest and refit near Laon. Brigadier General Friedrich von Derschau assumed command of the division on July 9. On July 19, 1918, the division was thrown into line just southwest of Rheims as part of the Second Battle of the Marne. It was withdrawn early in August. About September 30, it came back into line northwest of Rheims, near Prouilly and Cormicy. The division remained here, and was driven back, fighting stubbornly near Brimont, Guignicourt and Banogne, until it was withdrawn on November 7, 1918; the same day, Brigadier General Georg von Alt-Stutterheim assumed command. The next day, the division was put back into line on November 8 near Mezières; it had not been withdrawn when the armistice was signed on November 11, 1918. The 50th Infantry Division was rated by the Allies as a first-class division. It distinguished itself in the fighting during 1918. Major Hans von Troilo, the 53rd Infantry Regiment commander, went on to be awarded the Pour le Mérite. General Georg von Engelbrechten, the division commander, also won the Pour le Mérite. During the entire war, the 53rd Infantry Regiment lost 132 officers, 300 non-commissioned officers and 2,450 enlisted men killed in action. In just the fighting at Verdun, the XV Army Corps, to which the 53rd Infantry Regiment belonged for the battle, lost 93 officers and 2,931 enlisted men killed in action, 291 officers and 14,659 enlisted men wounded in action and 15 officers and 1,735 enlisted men missing in action. Back to the luger. Given the proximity of the serial numbers serial 1430 d on the barrel and upper receiver and 741 d on the lower receiver, it is quite possible that the pistol with serial number 741 d (and marked with the unit designation) received damage to the barrel and upper receiver during the war and these components were replaced by unit ordnance personnel of the 50th Infantry Division with the barrel and upper receiver from pistol number 1430 d that may have been damaged as well and was stripped of useable parts. Both serial numbers indicate a production month of April 1915.